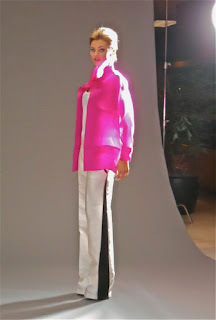 We had a long 11 hour photo session with John Casado for the Look Books of the Macy's Fashion Incubator San Francisco. Marc Grant became a gaffer extraordinaire while I pinned, pressed and helped stage. Jeanne kept things rolling and Veronica made up the models. But, of course, John knew just how to get the models to move and how to light them. It was quit an undertaking....over 600 shots...Now the designers have to decide which ones they want for their Look Books. It was a thrill to watch a master at work with his camera. He captured the best of each designers pieces. This photo was taken with my camera and without the automatic light John has attached to his camera..